I've seen my chickens eat some really weird stuff. Pretty much anything is fair game, including mice and frogs (ewwww). This time, it wasn't quite as gross, but definitely kind of strange and something I'd never seen them eat before. They were going crazy over the moss on the trees! It was kind of long and stringy, and they all took turns getting a taste. Red seemed to enjoy it the most and kept going back for more. I searched online and couldn't really find anything saying it was harmful for them to eat moss, so I let them have at it. What's the strangest thing your chickens have eaten? gotta get your greens where you can, i guess. :) cute! I've seen them eat frogs and mice, too, regularly... but moss! Wow! I'm so glad I found your blog yesterday! Those are hungry little girls - they will take what they can get ;) As always, love the photos! Stopping by from the BMB party. I guess when you're hungry, you're hungry - whether your a human, chicken or whatever :) I didn't realize that they ate smaller critters, though. That's interesting. I have seen my chickens go after a lizard before. I know it is not unusual, but I love to watch them chase grasshoppers. 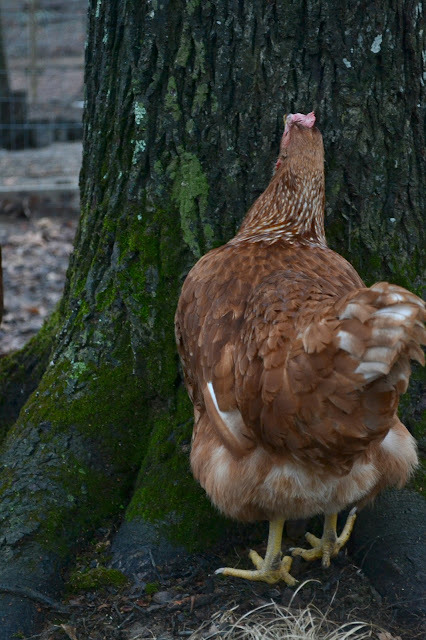 Your chickens always crack me up just a little bit. They are interesting little characters! I had no idea chickens eat frogs?? Crazy stuff! Tammy, while I don't have chickens (yet!) I was horrified when Kona ate a live baby bird. I tried to stop her, but she was too fast. I guess in her mind it was a simply another form of a snack, like a biscuit! But moss is so pretty! My girls found some green weeds today, you would have thought they were diamonds the way they were fighting over them. 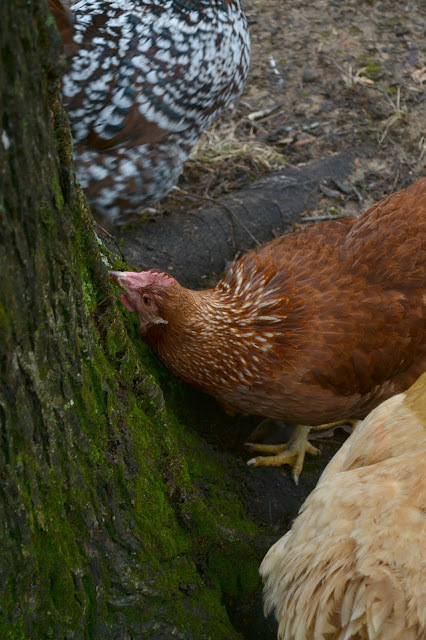 The snow is finally starting to give up its hold and has melted around the trees, the chickens are in heaven. I haven't seen this before! 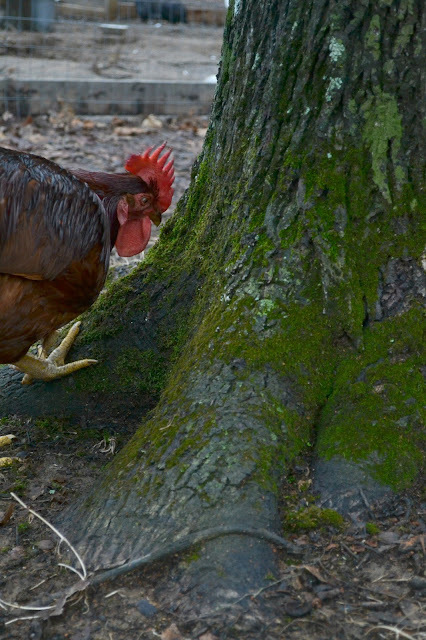 Chickens eat mice and frogs? Really!?! Wow, I learn a lot here! I haven't caught my ladies eating anything strange yet. I am more surprised at how fussy they are, and what they won't eat! Not sure the weirdest...but the most annoying...my chives. All of them. Grr. Your chickens are so interesting. They always make me smile. I love Red's intense gaze! That moss must have been good! I don't have chickens, but my cockatiel loves yogurt, chicken and eggs. Yea, he's a cannibal for sure! Will be following your blog.....pop over and say hi on mine. I don't have chickens, but the horses were seen eating Texas tumble weeds this week. Can't imagine that tasting any better than moss. That is really different and something my chickens will never eat, no moss here in the high desert! LOL!! Interesting. We don't have moss in our area and I haven't heard of them eating this either. I think if it doesn't hurt them it's all good. Hope your having a great weekend. I love you garden and the pics are so pretty! My party is up if you are interested. Have a super week! Happy Monday! We used to have chickens and that is strange. Unfortunately on our farm we were more concerned about all the animals that wanted to eat our chickens! All great shots and portraits! 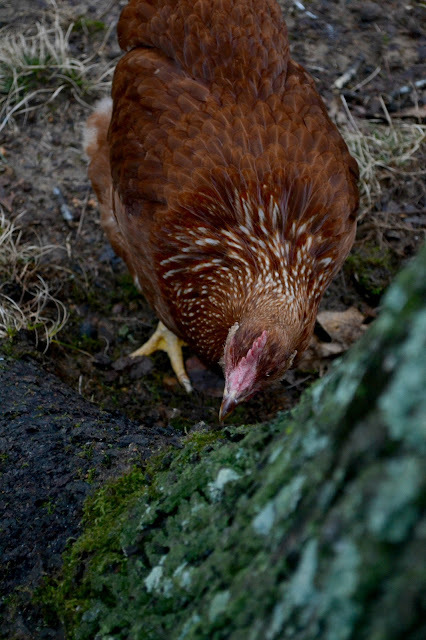 You have very healthy looking chickens, so what ever it is that she is picking at in that moss - I bet it's very good for her!! Plus the moss may be alike a salad to her?? Really nice photos of your feathered friends. Think I saw a Speckled Sussex in the mix : ) I am sure mine would go for anything green like that. Especially this time of year! Great photos. Lovely to see your post! It is perfect for the theme! Found you through the clever chicks bh too. we are new to chickens so I was horrified to see ours snap up a little skink one day when I was in the veggie patch. Up until then I thought that chickens were vegetarians! This is so funny! I've never seen out girls do this - we did have an egg layed in the goat's hay feeder the other day. Those crazy chickens! I'm always surprised at what they'll eat. Ours eat almost anything. Living in the city is hard with chickens because we have a lot of gross debris blow into our yard from the neighboring rite aid and street traffic. I've seen my chickens gobble up a chunk of Styrofoam before I could get it away from them! I think at this point I'm less surprised by what they WILL eat and more surprised by what they WON'T eat! I threw out an old artichoke a few weeks ago and was shocked that it went untouched. They must not have known what glorious bits were on the inside! tehehe a little desperate for some greens? !